Let your kids make their own fun this weekend. 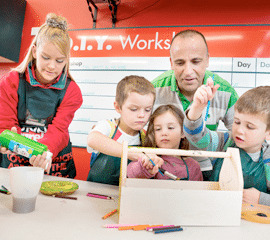 Bring them along to our free Kids DIY Workshops at Bunnings where they’ll make fun, creative projects like toolboxes, toy trucks, planter boxes and painting projects. With a different theme every week from garden and woodworking to paint, mosaics and recycled wall art, these workshops are free for children over the age of 5. An adult must accompany all children.